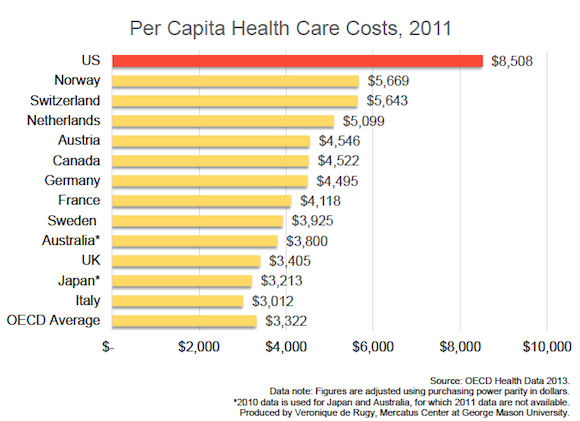 Americans currently spend about twice as much per capita on health care than residents of other advanced nations. These charts use the latest health spending data from Organization for Economic Co-operation and Development (OECD) to compare the level and growth rate of health care spending in the United States to those of other developed countries. In 2011, the most recent year in which most of the countries reported data, the United States spent 17.7 percent of its GDP on health care, whereas none of the other countries tracked by the OECD reported spending more than 11.9 percent. 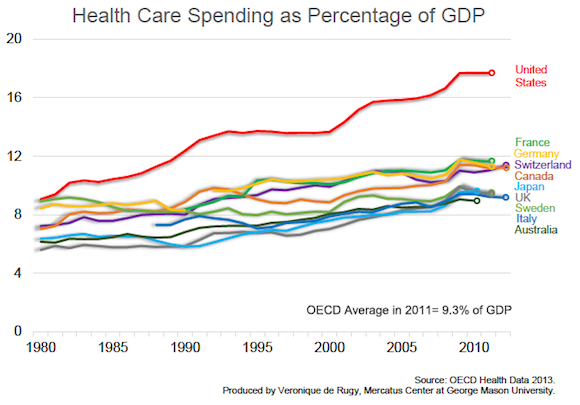 The first chart shows health care spending as a percentage of the economy. The share of American GDP devoted to health spending grew from 9 percent in 1980s to about 18 percent of GDP in 2011, even as the OECD average remained under 11 percent of GDP. This doubling in health spending as a share of GDP is one of the largest growth trends in the OECD. The United States not only spends much more on health care as a percentage of GDP, but this spending has grown more rapidly than most other nations. 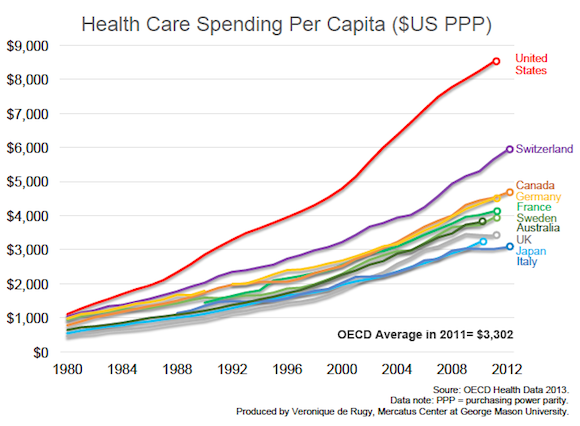 America currently has the highest per capita health care spending level in the OECD. The next two charts show per capita health spending over time and a snapshot of 2011 in US dollar purchasing power parity. The United States spends $8,508 per person, two and a half times more than the average of $3,322 for OECD countries. America spends about 50 percent more than Norway, the next largest per capita spender. With health care spending likely to climb to nearly a fifth of the US economy by 2021, up from 17.9 percent in 2011, we must start separating which part of this is actually buying us better health outcomes and which part is the product of government intervention in the health care market.